Grace Kelly was an up and coming Hollywood starlet who chose the good life of being Monegasque royalty over the glamor of being Hollywood royalty. 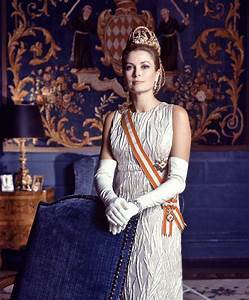 But in the pre-history of becoming Princess Grace of Monaco, Kelly made several prominent pictures for Hollywood. In only her second film she soared to fame as the wife of Gary Cooper's Marshal Kane in High Noon. From there it was just a hop, skip and a jump to being one of Alfred Hitchcock's favorite leading women, starring in not one, not two, but three of Hitch's films in the space of two years. 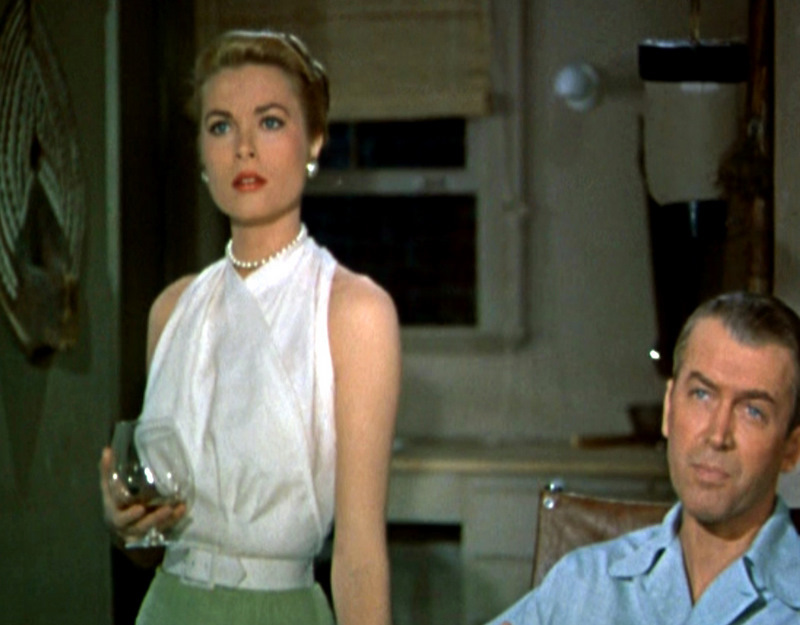 In succession from 1954, Hitchcock filmed Dial M for Murder, Rear Window and To Catch a Thief, all of which featured Kelly as his leading lady. Arguably the most well known of these was her role as Jimmy Stewart's girlfriend in Rear Window, but she excels in all three roles. 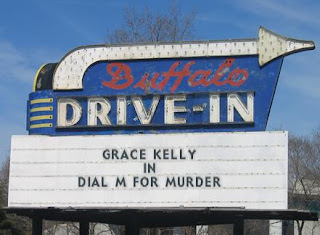 In Dial M for Murder, Kelly plays the wife of a former tennis player, Tony Wendice. 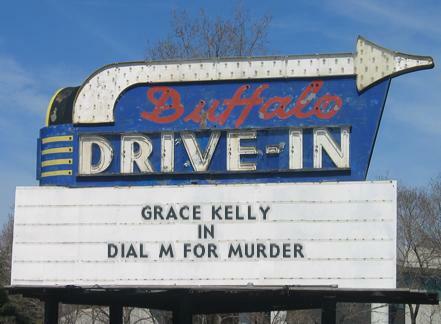 Did you know Dial M for Murder was originally filmed in 3D? It was. It accounts for some of the odd angles that the film has. The movie was shown in it's 3D format during the first few days of it's original theatrical run, but played to low numbers of audiences, so a hasty decision was made to throw out the 3d format and just run it in it's regular 2d form. Both were available. The 2d gorm was given to theaters without the ability to show 3d movies. 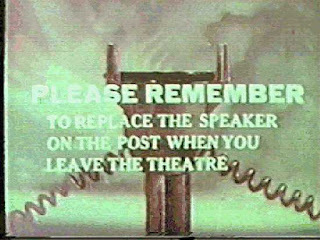 after the debacle at 3d movie theaters, they all used the flat form instead. I wonder if someone had spiked Hitch's drinks to get him to agree to film a 3d movie. It certainly doesn't seem like his themes would lend themselves to that format. At rany rate, the 3D craze was already dying out by this time, anyway. There are two kinds of marriages. One is a happy marriage where the two spouses are in love with each other, no matter what comes their way. In a Hitchcock film, this would be tantamount to disaster. After all, who would get interested in a suspense film where everything was hunky-dory? 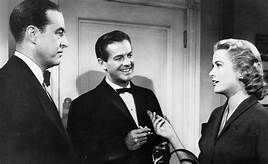 In the Wendice household, Tony Wendice (Ray Milland) has become aware that his marriage to Margot (Grace Kelly) has been falling apart for some time. It seems Margot has been carrying on an affair with an American crime novelist, Mark Halliday (Robert Cummings). Divorce is not an option for Tony. He married money. If he divorced Margot, he would be out of the house, but also out of money. So he devises a plan to murder his wife, thus insuring that he keeps his extravagant lifestyle going. To that effect, he blackmails a former college class mate, C. A. Swann (Anthony Dawson), to commit the murder. Tony has some information on Swann's activities that he threatens to reveal if Swann does not agree. 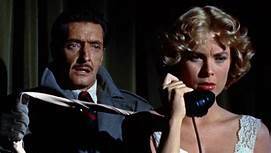 Tony arranges an alibi for himself and leaves a key to the apartment for Swann to use. He then arranges an elaborate ruse which involves him, Tony, calling home to arouse his wife out of bed so Swann can strangle her while she is on the phone. Unfortunately for Swann, Margot is not willing to go gently into that good night. She ends up stabbing Swann with a pair of scissors. Now, instead of having a dead wife, Tony has a dead would-be murderer on his hands. And he must somehow deal with the presence of the man in his apartment. Of course, the police are called and the situation develops as how to resolve the situation. Tony uses every wiles available to try to avoid his complicity in the event, and as a result, Margot is arrested because she apparently killed Swann because he was blackmailing her for her affair with Mark. In reality, it was Tony who was blackmailing her. He of course knew about the affair, hence the reason he wanted to murder his wife, rather than divorce her. 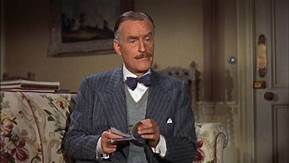 The police inspector investigating the story, Chief Inspector Hubbard (John Williams), initially believes that Margot is guilty and she is convicted and sentenced to die. But he becomes suspicious, and during his subsequent investigations becomes convinced that Tony had something to do with it. But how to break down Tony's alibi? Thus the final reel becomes a battle of wits. Well, folks, time to make that drive home. Drive safely. Frankly, I think Grace Kelly is at her best in all three movies she made with Hitchcock, but To Catch a Thief and Dial M For Murder get overshadowed by Rear Window. "Tennis players are annoying, by the way"
Especially Jimmy Connors, who would have made an excellent villain.... Thanks for reading. I agree! It's really one of her best performances. I love John Williams in this film! Not sure right now if I ever saw him in anything before, at least as far as movies. I remember him as Shakespeare in an episode of The Twilight Zone, however. Thanks for reading. This is an under rated Hitch film- I love the ending shot of this scene with John Williams- only Hitch with that sense of humor. I also say this has one of hitch's best cameos gotta love that! I love Grace in this movie!! Thank you so much for doing this blogathon and I will see in you the future for the next one- maybe yours! I hope! My favorite Hitchcock cameo is in "Lifeboat" with the weight loss ad. 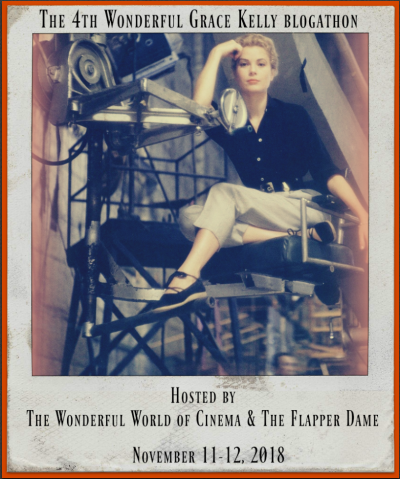 Hamlette and I are doing a Robots in Film blogathon, if you haven't already joined. Thanks for reading. I saw the film in 3D in a cinema in Montreal and, honestly, it's pretty much only worthy for the failed murder scene and the shot of Ray Milland's finger dialing the phone number. But except that, it was not worth it. 3D was just a flash in the pan back then. Unfortunately due to damage to my left eye from glaucoma, I can't see the new 3d, so I can't compare. Thanks for reading. Great article on a movie I like a lot! Wish I could have seen it as intended in 3D--maybe someday! I LOVE Grace Kelly and just saw her Oscar winning role as Bing Crosby's wife in The Country Girl. Good actress as well as beautiful. 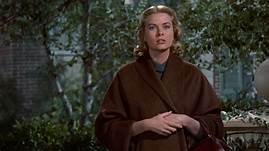 Wish she had come back to do one more film--Hitchcock wanted her to do Marnie but she feared her Monegasque subjects would not like seeing her kiss Sean Connery! LOL. 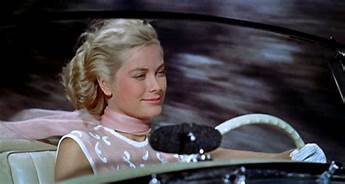 I have only seen Grace Kelly in her outings in Hitchcock films. But those are good. Thanks for reading. 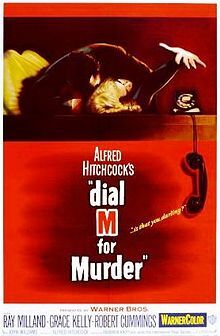 I must admit, I don't remember much about Dial M for Murder except for the interesting filming techniques and the elaborate takes. I wonder if the story would work conventionally - or perhaps even as a stage production. It was originally written for the stage, just never produced as such. thanks for reading.